Enroll in POR1000, Elementary Portuguese, excel in your course and earn a free trip! Award Portuguese Gives you Wings! 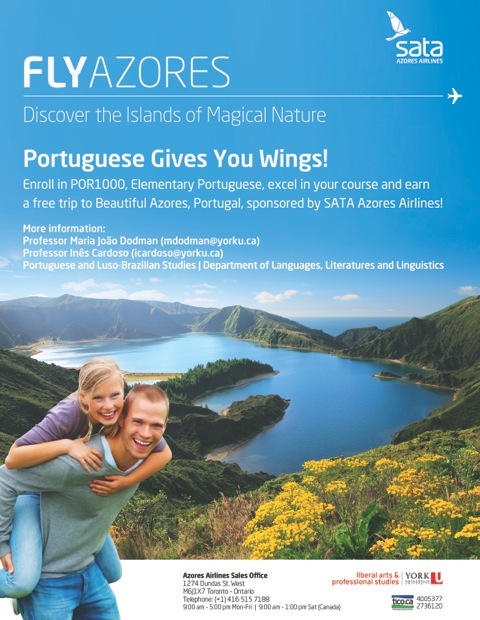 Enroll in POR1000, Elementary Portuguese, excel in your course and earn a free trip to Beautiful Azores, Portugal, sponsored by Sata Azores Airlines! This award reflects the objectives shared by the Program of Portuguese and Luso-Brazilian Studies as well as the Faculty of Liberal Arts and Professional Studies to further develop and invest in Experiential Education. Following the Elementary language course, the award recipient will have an opportunity to practice the skills learned in the classroom in a Portuguese-speaking setting. This unique immersion opportunity provides the locale for the student to live the language in an authentic cultural environment. In addition, the student will also experience life in the Azores, a group of islands widely recognized, including by UNESCO and National Geographic, for its natural beauty, ecological and sustainable development and its açorianidade, a term coined by 20th century Azorean intellectual, Vitorino Nemésio, that stands for the particular identity of the islands and its inhabitants. This award is representative of the overall program efforts to provide students from first to last year with significant and meaningful opportunities to engage with the language. It offers a privileged space designed to stimulate not only language interaction, but also the sense of belonging to a wider, global community while valuing cultural difference and the richness of a language within its regional variations. The Program of Portuguese and Luso-Brazilian Studies (originally created in 2008 as Portuguese Studies) offers a wide range of courses within a rich interdisciplinary scope. The program uses the latest technologies and student-focused teaching platforms in order to enhance the learning process. The Program exposes students to a wide range of experiential education opportunities on and off campus. Some of these opportunities include: community placements, interactive cultural and academic events as well as the inclusion of volunteer Portuguese speakers in our language courses. These speakers allow for a live interaction with the language and they represent a wide variety of Portuguese-speaking backgrounds. Our student body, like the university, is quite diverse and signals the growing interest in the language. Many students wish to study the language and culture of their ancestors, while others wish to travel and work in a Lusophone country or with the Portuguese-speaking communities in Canada. Still, others come to our program because they have experienced a variety of cultural expressions (for instance, music or dance) and wish to know more. The SATA group is a conglomerate dedicated to the aviation industry. Founded in 1941, the head office is located in Ponta Delgada, in the island of São Miguel, Azores. With representation in several countries, SATA boasts over eighty destinations, with international, national and island routes. SATA's principles, based on values such as quality, professionalism, punctuality and hospitality, also feature the company's commitment to collaborative initiatives, such as this award, as well as any others destined to promote the Portuguese language. SATA Canada is also a valued community partner of the program's advanced experiential education course: "Language in Context: Portuguese in the Greater Toronto Area".